What better way to end an evening than in Harlem with some sightseeing and live jazz? Enjoy a 3.5-hour tour across 125th Street, then a lovely stroll along Adam Clayton Powell Boulevard, and finish at a stop in Harlem known for some of the best live jazz. Harlem - the birthplace of jazz. Each year thousands of visitors and tourists flock to Harlem club's seeking to experience the soulful music that Harlem has come to be known for. When the lights go down the soulful immortal sounds and rhythms of Duke Ellington, Lena Horne, Billie Holiday, Ella Fitzgerald, Miles Davis (to name just a few) come alive! Their voices live on throughout the city as performers pay tribute to these greats every night. What better way to end an evening than in Harlem with some sightseeing and live jazz. 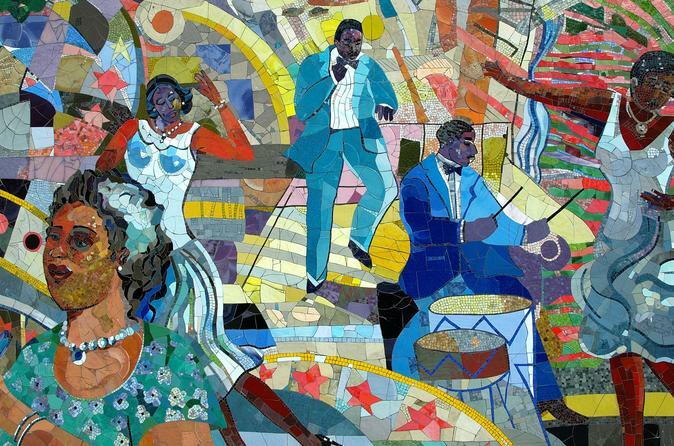 Enjoy a 3.5-hour tour across 125th Street, and then a lovely stroll along Adam Clayton Powell Boulevard, up to uptown and finish at a stop in Harlem known for some of the best live jazz. During the tour, you will see historical churches and famous night clubs of the past, a glimpse at some of the most beautiful homes that Harlem has to offer and other historical places of interest. Food and drinks are available for purchase at the jazz location - so come hungry for some history, jazz and food. This will be a night that you won't forget!